Mahrad Paymani, M.D. & Pairoj Sae Chang, M.D., Ph.D. In the office or in the hospital, patients can expect to receive the same excellent care from the interventional radiologists at Lake Medical Imaging. When the liver encounters any of the diseases that cause cirrhosis, scar tissue can form and interrupt normal blood flow through the liver, compromising or disabling the liver’s ability to clean the blood of toxins. The scar tissue also causes blood to pool in the vessels serving the liver, triggering them to bulge or bleed and become dangerous afflictions known as varices. Mounting blood pressure in the portal vein generates a serious condition called portal hypertension, which creates varices within the network of vessels flowing from the liver. The internal bleeding caused by varices branching to or from the liver can be fatal. Modern technology has created an effective life-saving treatment to help bypass diseased vessels called Transjugular Intrahepatic Portosystemic Shunt, or TIPS. TIPS is an almost painless, minimally-invasive procedure in which a shunt is inserted to create a new passage to assist blood flow through the liver, helping to restore the organ’s immune function and relieving pressure within the portal vein and other vessels serving the liver. Embolization, a fairly new treatment method, is a way of occluding (closing), or, at least, drastically reducing blood flow to one or more blood vessels that are doing more harm than good. One of a variety of materials, depending on whether vessel occlusion is to be temporary or permanent, is passed through a catheter, its tip lying in or near the vessel to be closed. This approach can be used to control or prevent abnormal bleeding as well as to shut down the vessels that support a growing tumor. Therapeutic embolization may also serve to eliminate an arteriovenous malformation (AVM), an abnormal communication between an artery and a vein. The term “embolization” derives from embolus, which can be any object that circulates in the bloodstream until it lodges in a blood vessel – in this case, a synthetic material or medication specially designed to occlude the blood vessels. Sometimes, clots develop in the leg veins called deep vein thrombosis. A clot, or a piece of it, can move out of your leg and flow towards your heart and lungs, which could be life threatening. An Inferior Vena Cava (IVC) filter protects the lungs from these life threatening clots. It is a filter placed in the inferior vena cava, which is a large vein that connects your leg veins with your heart. The IVC filter, placed by an Interventional Radiologist, traps blood clots. Thrombolysis is the treatment to break up abnormal blood clots that are restricting blood flow. Thrombolytic therapy dissolves these blood clots using various medications administered directly into the clot through a catheter. Thrombectomy is the disruption of a blood clot using one of several mechanical devices. Our Interventional Radiologists can use either or both of these methods to dissolve and remove blood clots. Radiological thrombolysis can greatly improve blood flow, and reduce or eliminate the related symptoms and effects without the need for more invasive surgery. Atherectomy is a procedure to remove plaque from the arteries. Plaque is the buildup of fat, cholesterol and other substances in an artery’s inner lining. Coronary atherectomy removes plaque from the arteries supplying blood to the heart muscle. It uses a laser catheter, or a rotating shaver (“burr” device on the end of a catheter). The catheter is inserted into the body and advanced through an artery to the area of narrowing. A relatively new device has been FDA approved for percutaneous treatment of peripheral (non-coronary) arteries. This uses a rapidly rotating blade (about the size of a grain of rice) that shaves the plaque that has built up along the walls of the artery and pushes it into a cone mounted on the catheter that allows actual removal of the tissue. The Interventional Radiologists of Lake Medical Imaging are proud to be one of the first to utilize this new technology in the state of Florida. Angioplasty is a way of opening a narrowed or closed blood vessel without having to do major surgery. Instead, a catheter with a tiny balloon at its tip is inserted into the vessel – usually one of the coronary arteries supplying the heart wall or a major artery bringing blood to an arm or leg. After advancing the catheter until its tip is at the site of blockage, the balloon is inflated and then deflated and removed. The narrowing or blockage most often is caused by arteriosclerosis, or hardening of the arteries, when fatty plaque forms on the inner wall of the artery and becomes larger, gradually cutting down on free blood flow. Expanding the balloon stretches the arterial wall and disrupts the fatty plaque, helping to restore blood flow. Between 70% and 90% of angioplasty procedures use a stent, a hollow thin-walled wire mesh tube, to keep the vessel open after widening it. Otherwise, because arteriosclerosis is an ongoing disease, more plaque might form and again limit blood flow. The stent is placed onto the balloon and pressed firmly against the artery wall when inflating it. The balloon is then deflated, leaving the stent in place to act as a scaffold. Many methods of minimally invasive therapy have been tried in recent years to eliminate tumors in the liver, kidneys, and lungs. 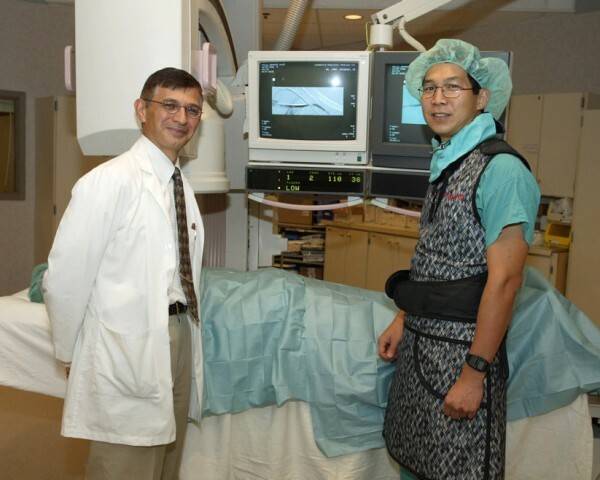 One of the most promising is called radiofrequency ablation, sometimes referred to as RFA. A special needle electrode is placed in the tumor under the guidance of an imaging method such as ultrasound, computed tomography (CT) scanning, or magnetic resonance (MR) imaging. A radiofrequency current is then passed through the electrode to heat the tumor tissue near the needle tip and ablate – or eliminate – it. The heat from radiofrequency energy also closes up small blood vessels, thereby causing only minimal discomfort. RFA may be done as an outpatient procedure without general anesthesia. Admission to the hospital is often not necessary. Vertebroplasty is used to treat pain caused by osteoporotic compression fractures. Vertebroplasty is an image-guided, minimally invasive, nonsurgical therapy used to strengthen a broken vertebra (spinal bone) that has been weakened by osteoporosis or, less commonly, cancer. Vertebroplasty can increase the patient’s functional abilities, allow a return to the previous level of activity, and prevent further vertebral collapse. It is usually successful at alleviating the pain caused by a compression fracture.